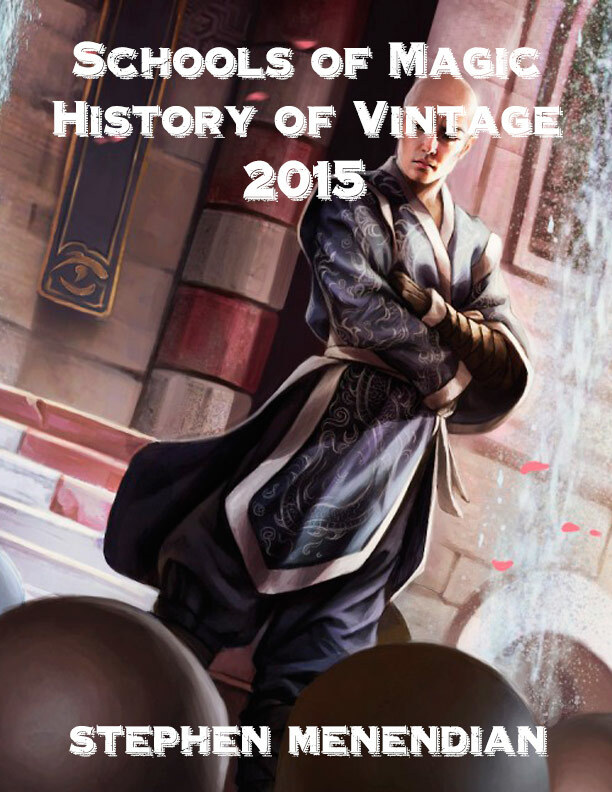 2015 was a year packed with changes in of the History of Vintage. Large tournaments around the globe and the significant rise in Vintage players on the Magic Online platform provided ample proving grounds for an increasingly fast changing format. Read all about the restrictions, unrestrictions, and format-defining new printings in Khans block and Magic Origins that set the format on a collision course. The first expansion to Khans block and 66th Magic expansion set, Fate Reforged arrived on January 23rd. Coming on the heels of the format’s first restriction in half a decade, Fate Reforged would compound the problems that Khans had introduced. This small expansion featured more delve spells and some intriguing creatures with hybrid mana activations, including Tasigur, the Golden Fang, which became an immediate conversation piece. But by far the most intriguing printing was a new growing creature, Monastery Mentor. Mentor blended features of both the horizontal and vertical growing threats, but in so doing, created an exponential growth potential that had never before been seen. For this reason, we noted that he could grow as “large as a Blightsteel” in our So Many Insane Plays Podcast Vintage set review. The fact that Mentor triggers off of a broader spell base and that the tokens also grow vertically for greater threat pressure did not escape Vintage players. Not only is Mentor a board trump over Young Pyromancer, but just three spells and three tokens with Mentor in play totaled 17 damage. The slightly increased mana cost, however, meant that Mentor pushed Comer School pilots towards an expanded mana base. Mentor was a more expensive, but a far more explosive threat. Although Brian Kelly reported that Tasigur was testing better for him than Mentor, contrary to his expectations, TheManaDrain user “Ten-Ten” opined that “I can totally see Monastery Mentor being restricted. Stronger than Tinker/Colossus, Imho.” For a format that had not restricted a creature since Ali from Cairo, speculation such as this in the days before Mentor had yet seen any play reveals how powerful Mentor was regarded from the outset.